The governor with his nominee, Gregory T. D’Auria. Gregory T. D’Auria, who oversees the appellate division of the attorney general’s office as solicitor general, was nominated Wednesday as a justice of the Connecticut Supreme Court by Gov. Dannel P. Malloy. D’Auria, 53, of Hebron would succeed Justice Peter T. Zarella, who retired at the end of 2016. His nomination is subject to confirmation by the General Assembly. Attorney General George Jepsen named D’Auria as his top appellate lawyer soon after taking office in 2011. D’Auria, a lawyer in the office since 1993, previously headed the special litigation and charities unit. “I am confident that his history of public service will continue with distinction on the bench,” Malloy said. He was introduced as the governor’s fifth nominee to the Supreme Court — his first, Lubbie Harper Jr., left the court when reaching the mandatory retirement age of 7o — in a press conference at the State Capitol on a day when attention was focused on President Trump’s nomination of Neil Gorsuch to the U.S. Supreme Court. D’Auria thanked Malloy, Jepsen and Jepsen’s predecessor, U.S. Sen. Richard Blumenthal, who hired D’Auria. D’Auria smiled and thanked her. Four of the seven justices will be Malloy appointees once D’Auria is confirmed as a successor to Zarella, a conservative appointee of Rowland, a Republican. A fifth is possible in late 2017 or early 2018 with the retirement of Dennis G. Eveleigh, appointed in 2010 by Republican Gov. M. Jodi Rell in her final year in office. Unlike in Washington, where the appointment of the conservative Gorsuch is expected to tip the balance on a 4-4 court, nominations to the Connecticut court generally are not tracked by ideology. 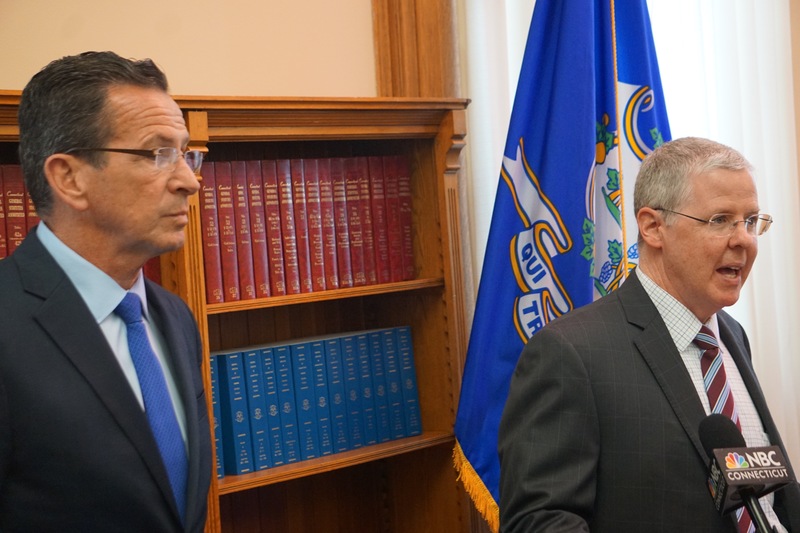 “Luckily, our courts in Connecticut operate, I think, in a far less political way,” Malloy said. Malloy’s three current appointees on Connecticut’s highest court — Carmen E. Espinosa, Andrew J. McDonald and Richard A. Robinson — split on a decision striking down the last vestige of capital punishment in Connecticut: the sentences for 11 men awaiting execution under sentences handed down before the General Assembly repealed the death penalty for future crimes. D’Auria says he will recuse himself on appellate cases he handled as solicitor general, a title he was the first to hold in Connecticut, Jepsen said. D’Auria is a graduate of the University of Connecticut and the University of Connecticut School of Law.